A man sought by Polish authorities under a European Arrest Warrant (EAW) can be surrendered despite systemic and generalised deficiencies in the courts of Poland presenting a risk to the fundamental right to a fair trial being breached, the High Court has ruled. Following a referral to the Court of Justice of the European Union (CJEU), Ms Justice Aileen Donnelly found the facts of Artur Celmer’s case did not reach the “high threshold” necessary to prevent his surrender. In the High Court in March 2018, Ms Justice Donnelly referred two questions to the CJEU based on the finding of systemic breaches to the rule of law in Poland, which had an impact on fair trial rights, and therefore brought into question the surrender of Artur Celmer to Poland pursuant to a European Arrest Warrant. In July 2018, the CJEU held that “the existence of a real risk that the person in respect of whom a European arrest warrant has been issued will, if surrendered to the issuing judicial authority, suffer a breach of his fundamental right to an independent tribunal and, therefore, of the essence of his fundamental right to a fair trial… is capable of permitting the executing judicial authority to refrain, by way of exception, from giving effect to that European arrest warrant, on the basis of Article 1(3) of Framework Decision 2002/584” (emphasis added). Following the CJEU ruling, in August 2018 Ms Justice Donnelly said that before surrender could be refused, the Court had to make a “specific and precise” assessment as to whether in the particular circumstances of the case there were substantial grounds for believing that Mr Celmer would run the risk of a breach of his right to be tried before an independent tribunal. For the purpose of assessing that risk, Ms Justice Donnelly requested further information from Poland. In October 2018, the High Court made an order joining the Irish Human Rights and Equality Commission (IHREC) as an amicus curiae. In accordance with the principles set out in the CJEU’s ruling, the present judgment from Ms Justice Donnelly assessed the risk to Mr Celmer based on the further information submitted to the Court. 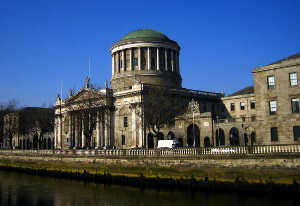 Ms Justice Donnelly said that the Court was required to make a determination as to whether Mr Celmer’s right to a fair trial under the Constitution of Ireland, under the European Convention on Human Rights, and under the EU Charter on Fundamental Rights, prohibited his surrender to Poland. As stated above, the CJEU referred to a breach “of the essence of his fundamental right to a fair trial”, therefore in the course of the hearing an issue arose as to the correct test or threshold in establishing the breach of fair trial that would prohibit surrender. Mr Celmer submitted that there was no basis for holding that the CJEU intended to limit the possibility of a finding of a real risk to a flagrant breach, and the IHREC submitted that since the CJEU had not used the language of a flagrant breach – breaching the essence of the right was a lower threshold. However, Ms Justice Donnelly said that it was “inconceivable” that the CJEU sought to amend the well settled test of flagrancy (set out in the ECtHR case of Soering v UK) by implication. It was also clear that the questions referred to the CJEU by the High Court referred to the test of flagrant denial, that the case was being made by reference to that standard, and therefore any diversion from that standard would have been highlighted in the CJEU’s judgment. In all the circumstances, Ms Justice Donnelly said that “the essence of the right and the flagrant denial of the right are to be understood as one and the same”. Ms Justice Donnelly also rejected the IHREC’s suggestion that the Polish government did not dispute that trial by a court which is not independent and impartial would amount to a flagrant denial of justice. Ms Justice Donnelly said that it was clear that the CJEU “expressly did not accept that a finding of systemic and generalised breaches was sufficient to establish that the individual concerned will run the risk of a breach of the essence of the fundamental right to a fair trial” – and that Mr Cemer and the IHREC did not address that “vital finding”. Ms Justice Donnelly said that the assessment had to consider the personal circumstances, the nature of the offence, and the factual context of the EAW. Although Ms Justice Donnelly concluded “that there is a real risk connected with a lack of independence of the courts of Poland on account of systemic or generalised deficiencies there, of the fundamental right to a fair trial being breached”, and that “the deficiencies in the independence of the judiciary will affect the court level before which [Mr Celmer] will be tried if surrendered” – when the totality of evidence was taken into account, the threshold for the refusal of surrender was not reached. In particular, Ms Justice Donnelly concluded that despite concerns about the Deputy Minister of Justice making adverse comments on Mr Celmer’s presumption of innocence, “even when taken in the context of the deficiencies relating to the independence of the judiciary in Poland”, did not give rise to a real risk that Mr Celmer would face a flagrant denial of his right to a fair trial on surrender to Poland. Stating that it would be for the Polish courts and, if convicted, perhaps the ECtHR that would have to decide whether any trial of Mr Celmer meets the standards of right to a fair trial, Ms Justice Donnelly said that the high threshold of preventing surrender, in accordance with the CJEU’s ruling, had not been reached on the evidence before the Court.